Our community advisory councils recently engaged in conversations with their communities about primary health. From those conversations, we learned that the biggest concern for people living in our region, is access to general practitioners. This year, Murray PHN is investing $3 million to strengthen general practice. The funding will help to improve patient care across our region. We're interested to hear about your ideas and experiences that will help to inform our general practice investment strategy. 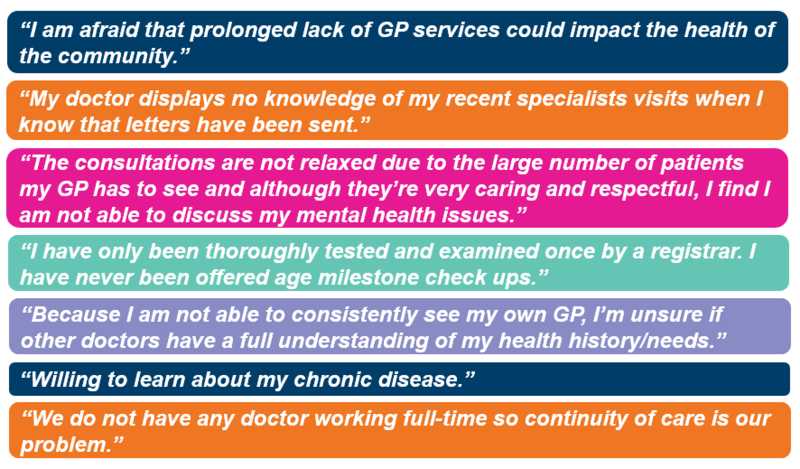 Our Health Voices (register to be a Health Voice here) were asked about general practice and in most instances were able to select more than one answer or skip questions. 90% of Health Voices have a GP that they prefer to see however only 10% of Voices could get an appointment with that GP in the past 12-months when they wanted to. The following insights are about Voices experiences over the past 12-months. NB: 9% of Voices hadn't seen a GP in the last month. NB: 3% said this question wasn't applicable to them and no Voices selected that they didn't want to be involved. 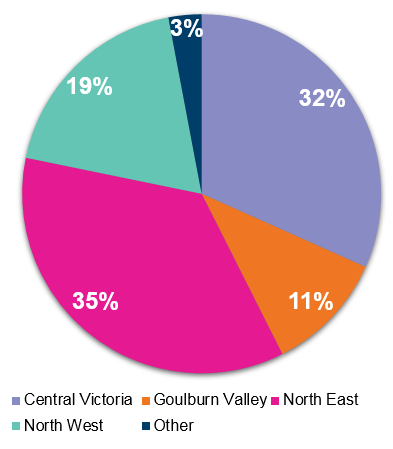 In the past 12-months, 50% of Voices have seen three or more different health professionals (such as a GP, specialist, physiotherapist or nurse) for the same condition. 44% of Voices said that they didn't experience any issues in their care that were a result of poor communication or coordination between health professionals however, 23% did and 5% couldn't remember if they did or didn't. 16% of Voices had seen a GP after hours for their own health, including both urgent and non-urgent care. 25% of Voices had been to a hospital emergency department (ED) for their own health. Thinking about the most recent visit to ED, 20% of Voices thought at the time that the care could have been provided at a general practice, while 38% said it couldn't and 5% didn't know if it could or couldn't. My general practice is very well run, I can always get to see the doctor of my choice, I never feel rushed, they charge a fee but not exorbitant. I shopped around to find this practice. The lack of universal bulk billing in either of our two nearest communities (Benalla and Mansfield) makes accessing services in a timely manner a challenge for many people. I don't have an issue with our GPs but do have a issue with the cost and the cost of ancillary services I need from time to time to manage my chronic disease. I think it would be good if doctors would look beyond the symptoms to see the body and mind as a whole and also understand the importance of diet and lifestyle to health. I think that those of us with a caring and knowledgeable GP, are incredibly fortunate. GPs should not judge their patients who are mentally ill and trying to help themselves. I feel that medicine treatment in Australia is outstanding and professional. We are so lucky to live here. Patient-centred coordinated care is desperately needed, particularly for people with chronic conditions that impacts on their overall health. Under current Medicare funding arrangements GPs do not have the time to take on this role, to better support their patients in understanding and managing their own health. The system is broken because they don't put the care of the patient first. Finding a regular Doctor for my family has been a nightmare. I am really surprised that doctor surgeries are not accredited. What we need is more investment into health promotion/prevention and health literacy so people can truly manage their own health. Kerang are in desperate need of doctors who can be here for long periods of time and ones that can deliver babies. So many practices don't accept new patients and hours don't suit working families, especially in rural areas. Health care is too GP focused. It would be good to see a nurse, physio, etc under Medicare. *General practices can still practice without accreditation however, those who are accredited have met a minimum number of safety and quality standards. Sunday and Public Holidays, all day. healthdirect also have an online (and mobile app) symptom checker and a 'find a health service' directory click here for more details. There are three supercare pharmacies currently in our region, in Bendigo, Mildura and Shepparton. Supercare Pharmacies are open 24 hours a day, seven days a week, with a registered nurse from 6-10pm who can provide advice and treatment for minor injuries or illnesses.